(21412.M657.12, Z. P. Meyers/Barney Hillerman Photographic Collection, OHS). FISHER, ADA LOIS SIPUEL (1924–1995). Oklahoma Civil Rights activist Ada Lois Sipuel was born February 8, 1924, in Chickasha, Oklahoma. An excellent student, she graduated from Lincoln High School in 1941 as valedictorian. Initially, she enrolled in Arkansas A&M College at Pine Bluff. After one year she transferred to Langston University in September 1942, and she majored in English and dreamed of being a lawyer. On March 3, 1944, she married Warren Fisher. On May 21, 1945, Ada Lois Sipuel Fisher graduated from Langston University with honors. Even in education, Oklahoma was segregated. Langston University did not have a law school, and state statutes prohibited blacks from attending white state universities. Instead, Oklahoma provided funding whereby they could go outside the state of Oklahoma and attend law schools and graduate schools that accepted blacks. At the urging of the National Association for the Advancement of Colored People (NAACP) twenty-one-year-old Fisher agreed to seek admission to the University of Oklahoma's law school in order to challenge Oklahoma's segregation laws and achieve her lifelong ambition of becoming a lawyer. On January 14, 1946, she applied for admission to the University of Oklahoma College of Law. After reviewing Fisher's credentials, the university's president, Dr. George Lynn Cross, advised her that there was no academic reason to reject her application for admission, but that Oklahoma statutes prohibited whites and blacks from attending classes together. The laws also made it a misdemeanor to instruct or attend classes comprised of mixed races. Cross would have been fined up to fifty dollars a day, and the white students who attended class with her would have been fined up to twenty dollars a day. On April 6, 1946, with the support of civic leaders from across the state, Ada Lois Sipuel Fisher filed a lawsuit in the Cleveland County District Court, prompting a three-year legal battle. A young attorney, Thurgood Marshall, later a U.S. Supreme Court Justice, represented Fisher. She lost her case in the county district court and appealed to the Oklahoma Supreme Court. It sustained the ruling of the lower court, finding that the state's policy of segregating whites and blacks in education did not violate the United States Constitution. After an unfavorable ruling from the Oklahoma Supreme Court, Fisher filed an appeal with the U.S. Supreme Court. On January 12, 1948, the nation's highest tribunal ruled in Sipuel v. Board of Regents of the University of Oklahoma that Oklahoma must provide Fisher with the same opportunities for securing a legal education as it provided to other citizens of Oklahoma. The case was remanded to the Cleveland County District Court to carry out the ruling. Following the Court's favorable ruling, the Oklahoma Legislature, rather than admit Fisher to the Oklahoma University law school or close the law school to students both black and white, decided to create a separate law school exclusively for her to attend. The new school, named Langston University School of Law, was thrown together in five days and was set up in the State Capitol's Senate rooms. Ada Lois Sipuel Fisher refused to attend Langston University School of Law, and on March 15, 1948, her lawyers filed a motion in the Cleveland County District Court contending that Langston's law school did not afford the advantages of a legal education to blacks substantially equal to the education whites received at OU's law school. This inequality, they argued, entitled Fisher to be admitted to the University of Oklahoma College of Law. However, the Cleveland court ruled against her, finding that the two state law schools were "equal." The Oklahoma Supreme Court, predictably, upheld the finding. After this second adverse ruling Fisher's lawyers announced their intention to again appeal to the U.S. Supreme Court. However, Oklahoma Attorney General Mac Q. Williamson declined to return to Washington, D.C., and face the same nine Supreme Court justices in order to argue that Langston's law school was equal to OU's law school. 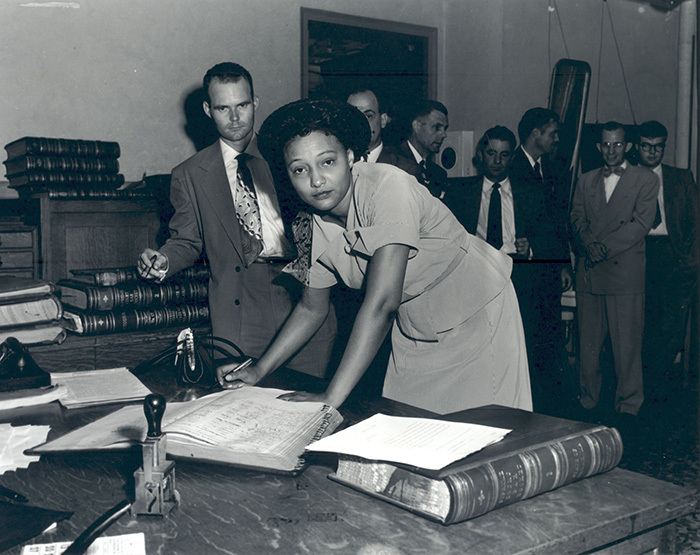 As a result of this concession, on June 18, 1949, more than three years after Ada Lois Sipuel Fisher first applied for admission to the University of Oklahoma College of Law, she was admitted. Langston University's law school closed twelve days later. Although Fisher was generally welcomed by her white classmates, she was forced to sit in the back of the room behind a row of empty seats and a wooden railing with a sign designated "colored." All black students enrolled at the University of Oklahoma were provided separate eating facilities and restrooms, separate reading sections in the library, and roped-off stadium seats at the football games. These conditions persisted through 1950. However, the end of segregation in higher education had already begun. In 1948 a group of six black Oklahomans applied to University of Oklahoma's graduate schools in disciplines ranging from zoology to social work. All were denied admission under the same statute that denied admission to Fisher. Thurgood Marshall selected one of the six students, George W. McLaurin, to present yet another challenge to segregation in higher education. In a June 5, 1950, U.S. Supreme Court decision in the case of McLaurin v. Oklahoma State Regents, the Court ruled that the restrictions of segregation imposed on McLaurin at OU impaired and inhibited his ability to study. The decision meant that blacks could no longer be segregated at OU and could now be admitted to graduate schools at all state-supported colleges and universities in the nation. The state soon realized that it could not create separate graduate programs for blacks similar to the sham law school it had quickly invented for Ada Lois Sipuel Fisher. In August 1952 Fisher graduated from the University of Oklahoma College of Law. She earned a master's degree in history from the University of Oklahoma in 1968. After briefly practicing law in Chickasha, Fisher joined the faculty of Langston University in 1957 and served as chair of the Department of Social Sciences. She retired in December 1987 as assistant vice president for academic affairs. In 1991 the University of Oklahoma awarded Fisher an honorary doctorate of humane letters. On April 22, 1992, Gov. David Walters symbolically righted the wrongs of the past by appointing Dr. Ada Lois Sipuel Fisher to the Board of Regents of the University of Oklahoma, the same school that had once refused to admit her to its College of Law. As the governor said during the ceremony, it was a "completed cycle." The lady who was once rejected by the university was now a member of its governing board. On October 18, 1995, Dr. Ada Lois Sipuel Fisher died. In her honor the University of Oklahoma subsequently dedicated the Ada Lois Sipuel Fisher Garden on the Norman campus. At the bottom of a bronze plaque commemorating Fisher's contribution to the state of Oklahoma, an inscription reads, "In Psalm 118, the psalmist speaks of how the stone that the builders once rejected becomes the cornerstone." Ruth E. Swain, Ada Lois—The Sipuel Story (New York: Vantage Press, 1978). Melvin C. Hall, "Fisher, Ada Lois Sipuel," The Encyclopedia of Oklahoma History and Culture, https://www.okhistory.org/publications/enc/entry.php?entry=FI009.